Angel in Fur is the inspirational and humorous memoir of an obstreperous puppy who went on to become the most celebrated therapy dog at a metropolitan children’s hospital. 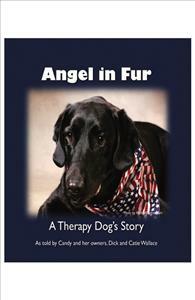 Angel in Fur is the inspirational and humorous memoir of an obstreperous pup who went on to become the most celebrated therapy dog at a metropolitan children’s hospital. This is her story, told through her voice, of her incredible journey that begins with touching the lives of thousands of sick children, and concludes with reciprocated love during her own courageous battle with cancer. Interwoven are her adventures at the hospital; her favorite patient stories; her favorite nurse stories; her community service; her hilarious tales of her indulged lifestyle; her awards from the hospital, and her media appearances on behalf of the hospital. Candy and the Wallaces are amazing as one find from readingAngel In Fur. Candy seems with us still as this first person biography of a Black Lab Therapy dog takes us through her fifteen years on the earth, faithfully visiting children in the hospital throughout her life. Always full of mischief, she was able to settle down to her work when needed. It's a message anyone can hear from the very young to the older compassionates among us.